By April, most people have given up on skiing. With longer days and chirping robins, outdoor enthusiasts turn their attention to warmer-weather pursuits such as tennis, mountain biking and hiking. That, however, is folly. Given our climate and its wicked penchant for snowstorms in May, you might as well embrace the snow — and skiing — until the gondola halts to a stop at Sunshine Village on Victoria Day. Besides, spring is arguably the best time to go skiing. I just spent an incredible weekend at Fernie Alpine Resort, where I floated atop powder and carved turns through corn snow, got a tan and drank beer on a patio while sweating from the heat. When was the last time you did all that in the same day? Come April, the powder-producing blizzards don’t hit as frequently, which means blue skies and sunshine. Bluebird days were a rarity in Fernie this winter, so I rather enjoyed this one, and the stellar views from everywhere on the mountain. It snows so much at Fernie, you easily forget the amazing views until a sunny day blows you away. I have always wondered why the hordes drive out to Lake Louise on opening weekend, when there’s no base to speak of and the only run open is Wiwaxy, but the resort looks like a ghost town in April and May when the base is over 200 cm and the entire mountain is open. It makes no sense. 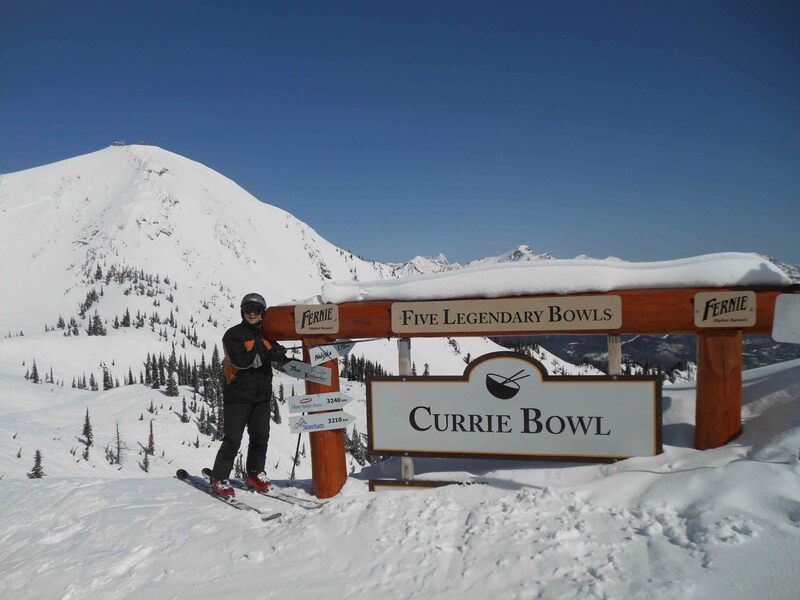 There was so much snow at Fernie this past weekend (427 cm base), the Currie Bowl sign was in danger of being engulfed. Also, you can still ski powder at the top of the mountain and slushie corn snow at the bottom. Get a late start to avoid the morning ice. There's so much snow, the Currie Bowl sign is slowly getting buried. Forget icy toes and hot chocolate breaks every hour. In the spring you can ski in far fewer layers and never get cold. Need I say more? 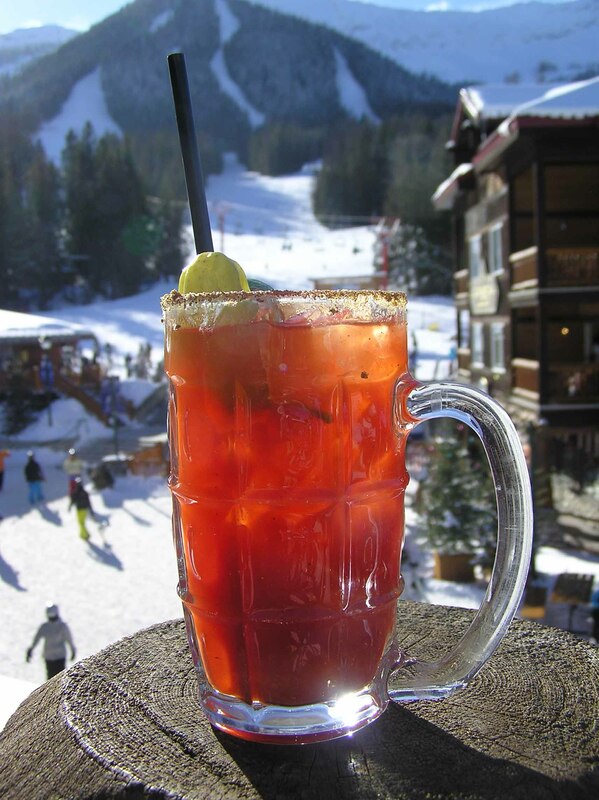 Sit on an outdoor patio and sip a cold beer or a cocktail, like this Griz Bar Caesar. What's better than apres ski? Outdoor apres ski. 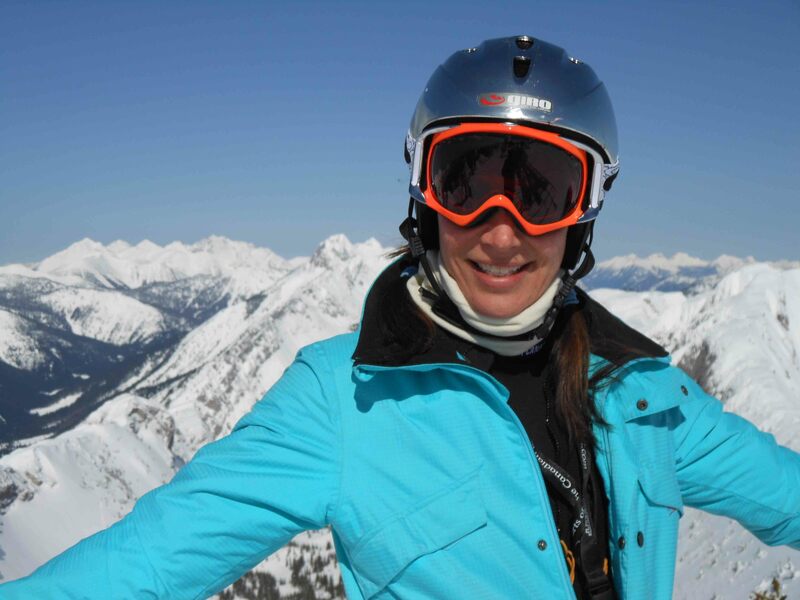 This entry was posted in Potpourri, Travel and tagged Fernie, Fernie Alpine Resort, spring skiing, spring skiing in Fernie. Bookmark the permalink.